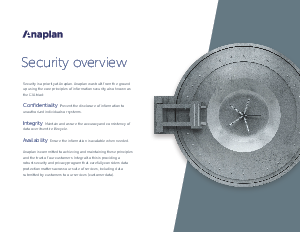 To support these principles, Anaplan was deliberately crafted as a highly distributed global company that allows for significant resiliency against threats and disasters. All functions within Anaplan are geographically distributed across the globe, reducing risks associated with regional events. The U.S. offices host most of the sales, marketing, and support activities. Staff in the U.K. and Singapore offices provide regional coverage, in addition to backup support.